During the Hop Grower’s Convention that was hosted by Stone Brewing Company I got to meet with the owners of 47 Hops, a mid-sized hop grower and distributor that helps bring some of the much-sought-after hops to the market. The evening was a lot of talk about the hop industry as it exists right now and some of the challenges ahead that will end up ultimately affecting the type of beer available and what the smaller breweries can make. The guys at 47 Hops were kind enough to treat a few other bloggers and me to beers, cigars, and pizza, though anyone present could tell you we were there mostly for the opportunity to chat about hops with someone in the industry. As many enthusiasts already figured out, one of the big problems facing the industry going forward is the massive increase in demand for certain varieties of hops. This means that citra and mosaic hops are becoming so much in demand that it is impossible for smaller breweries to get them. Consumers can demand beers made with these delicious hops (that among other things deliver some delicious citrus flavors that San Diego beer fans have grown to love) but there simply isn’t enough of either hop being grown to keep up with demand. Part of this comes from a sad reality of hop growing. In order to increase production to keep up with demand there needs to be some serious increase in funding, and the money just isn’t there. And as the amount of money involved becomes much larger, the length of contracts required before someone can buy hops becomes that much longer. Though five years ago the thought of a five year contract for hops seemed unthinkable, it is now a requirement especially if a brewery wants to keep some consistency and the hop growers want to know that they are going to be able to get the return on investment that makes expansion possible. Aside from funding, another thing keeping hop capacity from growing as fast as the hop heads might like comes down to certain requirements before a piece of land can be good for growing. Aside from finding the right place to grow as far as climate and quality of soil, growers have to worry about being within an hour’s drive of some cold storage facility. Just as heat can harm a hoppy beer and take away that bite, so too heat can harm the hop oils while they are still present in the buds, leaving the grower with a product that is much harder to move. And of course building a cold storage facility large enough to keep everything and keeping that running is not cheap. It is also not as easy to get those hops out to brewers in the form of wet hops or whole cone hops. This is because while that form of hops provides some fantastic intense flavors, they also are not able to survive long voyages. Thus, when hops are going to be transported from Washington State, where many of the hops are grown, to east coast cities like New York City the most practical way of doing that is by processing the hops into pellets. The same thing is true for hops shipped overseas. When hops are transported in large boats across the water, the best way to make sure they survive the voyage is to process the hops into pellets. This if why pellets still remain the most common way of purchasing hops. So with demand growing for certain varieties of hops, what is a likely prediction for the future? Most of the small breweries are not going to be able to get their hands on some of the more popular varieties. Hopefully this will lead to some experimentation in the sorts of flavors present in the beers as brewers try to make West Coast Style beers without some of the now common and expected hops. I expect some of the brewers will do just fine and will find ways to make interesting styles of IPAs with common varieties hops that hop-heads have otherwise gotten tired of. Maybe this will lead to some experimentation with the type of malts used such that things don’t all taste like Sierra Nevada Pale Ale. I also expect that it will be hard for smaller breweries to get their hands on large quantities of certain hops over the long term. The longer contracts are expensive and there is only so much to go around. So once they brew a fantastic beer with certain varieties of hops, without a contract in place that beer won’t taste exactly the same the next time. I am already seeing this around San Diego with smaller breweries IPAs varying from batch to batch due to supply. This makes it hard to consistently order the same beer from a smaller brewery if the small variations in hop variety change your enjoyment. I’ve realized recently that while I love hoppy beers, I don’t love every single variety. There are a lot of flavors of hops that I love, the citrus, tropical fruit, and occasionally the floral, and other flavors that I like sometimes and other times can’t stand. Though in some ways that is part of the fun of exploring beers and IPAs in particular. 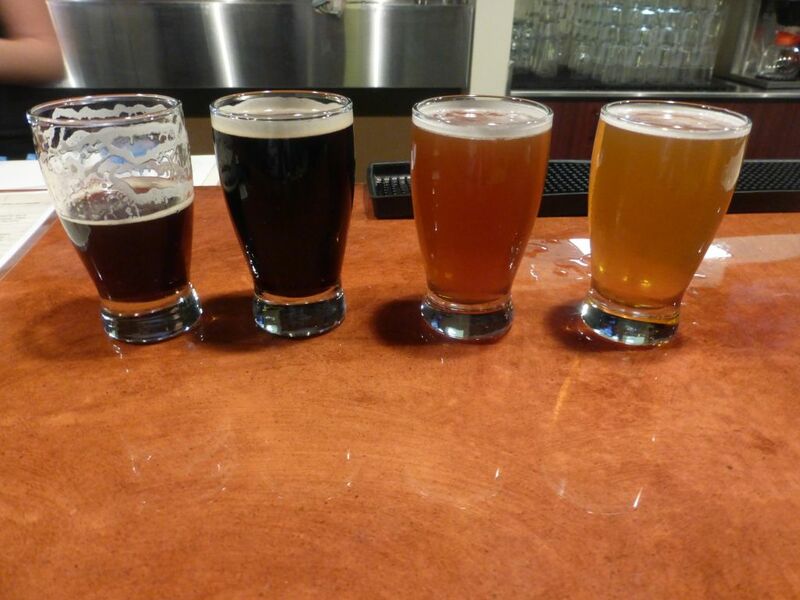 It is fun to learn to talk specifically about flavors you like so you can ask the bartender how a specific batch is and make a decision based on that without having to try a sample. And for the beer drinkers who can’t stand hoppy beers, don’t expect that they are going to disappear at any time but you might appreciate the experimentation in flavors other than hops that we may see out of this. It is always great when a small brewery makes a beer that showcases the unique flavors of rye in just the right balance. Others are waiting for an explosion of wild yeast flavors that have yet to become mainstream in San Diego but that enthusiasts have been enjoying for years. Scarcity of certain varieties and increase in cost may help push those trends to the mainstream more quickly as well. 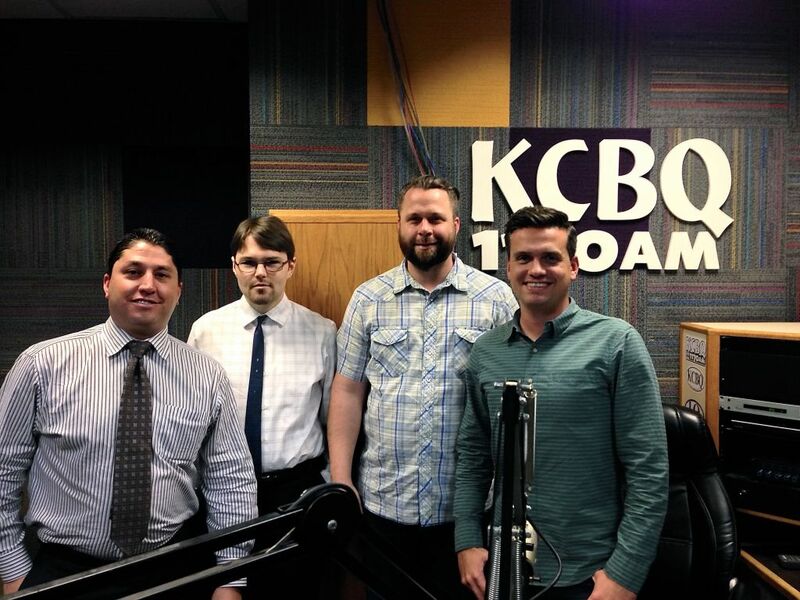 This past Thursday, January 15, 2015, I appeared on a local radio show called Craft City listing to discuss craft beer and other business things, including my family law practice. The show can be listened to in full below. Be sure to check out the segment with Candace Moon the Craft Beer Attorney (she beat me to it!) discussing various legal issues in the news lately relating to beer. If you really just want to hear me, go to the beginning of the second half of the show. If anyone else is interested in having me take part in a podcast or video feel free to hit me up and I will be glad to join. If you like this show, find Craft City Listings on Facebook to hear about upcoming shows. Part of what I love about this blog is being able to give people some idea what to expect with some new brew they might not be familiar with. Two of these are not completely new, but they are newly bottled recently and might be new to some people. The beers I am going to discuss today are Stone’s new Delicious IPA, which seems to have been flying off the shelves, Modern Times’ City of the Sun IPA, newly bottled, and the 2015 version of My Bloody Valentine from Alesmith. 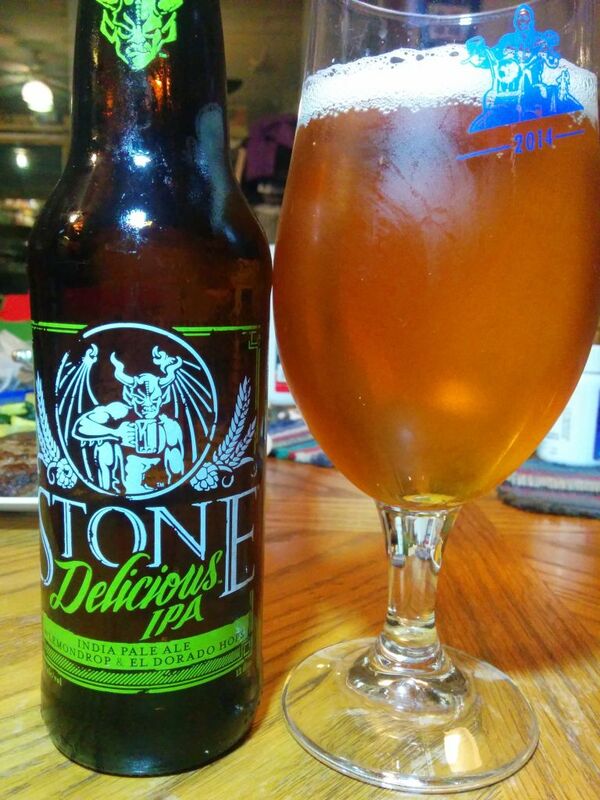 First up is the Stone Delicious IPA. This new brew is unique in a number of ways. Firstly, it is stronger than the typical Stone IPA, all the way up to a whopping 7.7%. (regular Stone IPA is 6.9%). It is also lighter on the malts and lighter on the bitterness, really focusing on the more delicate hop flavors, including some lemon. It also was brewed in a way that makes it officially gluten reduced. To see just how good this one was, I had to compare it side by side to the original Stone IPA. The first two I compared really did have a stark difference. The Stone IPA was satisfyingly bitter while the Delicious IPA had a lighter citrus flavor supported by some nice juicy flavors. Though the second Delicious IPA I opened was a bit more bitter, so not every single one you get in that six-pack is going to taste as delicate. I would be interested to see if this really converts any new hop-heads but it will certainly satisfy those of us who already exist. 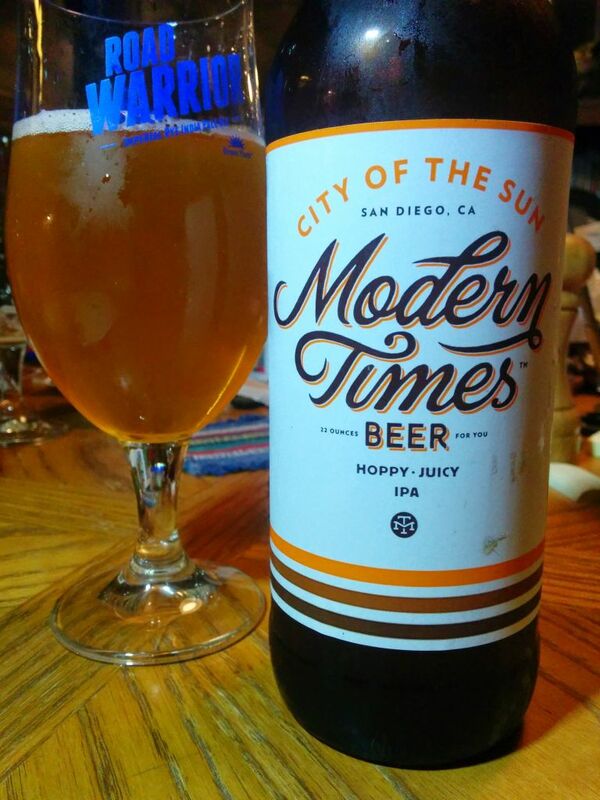 Next up is the City of the Sun IPA from Modern Times. This is the first in a series of bottle releases of IPAs that were previously available only at the tasting room. 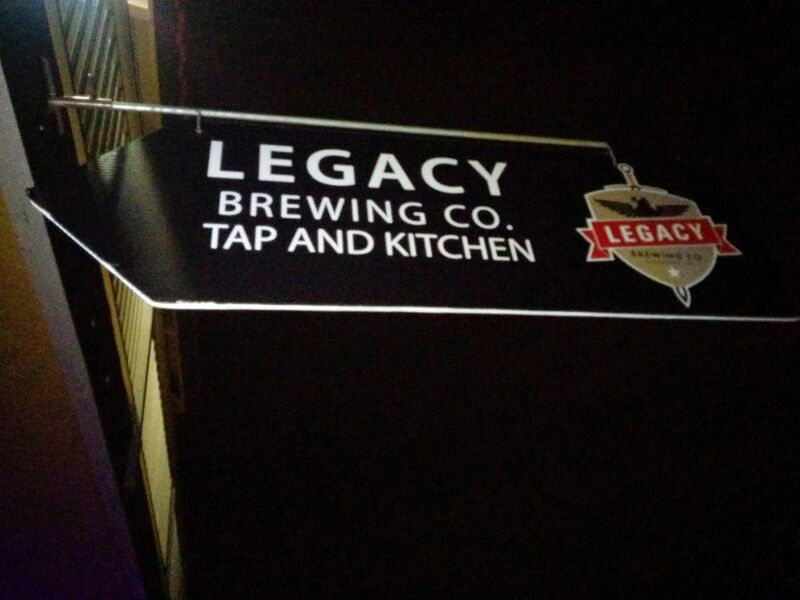 So if the name sounds familiar, you might have tasted it before on tap. If you had, you will remember just how much this is a delicious burst of flavor. Rest assured those flavors are still very much present in this beer and it will satisfy in the bottle. The only one that might have been better was that delicious fresh-hopped version I got to taste. Still, if you are into IPAs, this one should not be passed up. Also keep an eye out for the upcoming seasonal IPAs from Modern Times to be released throughout the year, including a return of the delicious Rye IPA Aurora later. 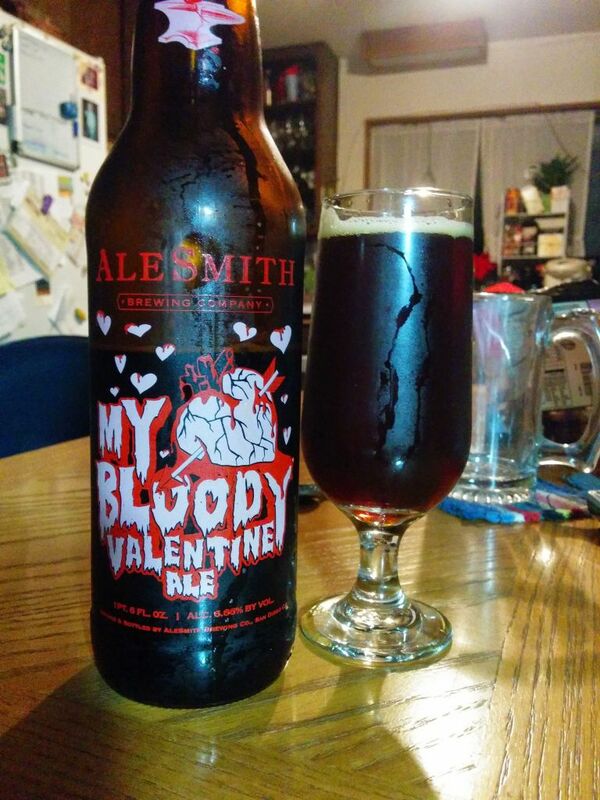 Finally we have the Alesmith My Bloody Valentine, a delicious darker hoppy beer meant to satisfy those who can’t seem to find love come Valentine’s Day in February. This is very similar to the Evil Dead Red that Alesmith puts out in October for Halloween. My Bloody Valentine has some roasted malts with a little chocolate and a nice floral/citrus hop bite. Despite the darker color this is not one for your friends who only drink stouts. My husband would dump this out if I made him taste it and then I might have to celebrate Valentine’s alone. Bottom line, if you like IPAs, don’t miss these new delicious offerings from Stone and Modern Times. And if you enjoy more complicated black IPA style beers, try the Bloody Valentine. The nut brown was really smooth and roasty. It was light body but very tasty. This is one beer I could have a few pints of easily. The porter had nice chocolate and coffee flavors that very mellow all blended together nicely with the caramel flavors. This one was also super smooth. The pale ale was intensely floral with flavors mostly around lavender. There is a certain line at which a beer starts to taste like perfume and this one comes close but stays on the enjoyable side of that line. For a pale this flavor was very unique among San Diego beers. I probably would have a hard time finishing a pint of this though. The Oktoberfest beer was a nice representation of the style, very good and smooth. The sleigh wreck ale was a seasonal beer on tap when I visited. It was a nice smooth ale with just a little bit of spice and plenty of roasted malt flavors. The milk stout was nice mostly because it was not too sweet like many can get. However, it didn’t really have any standout flavors that made me want to drink more of it. The Irish red showed some good malt flavors in a smooth and a little mellow beer. 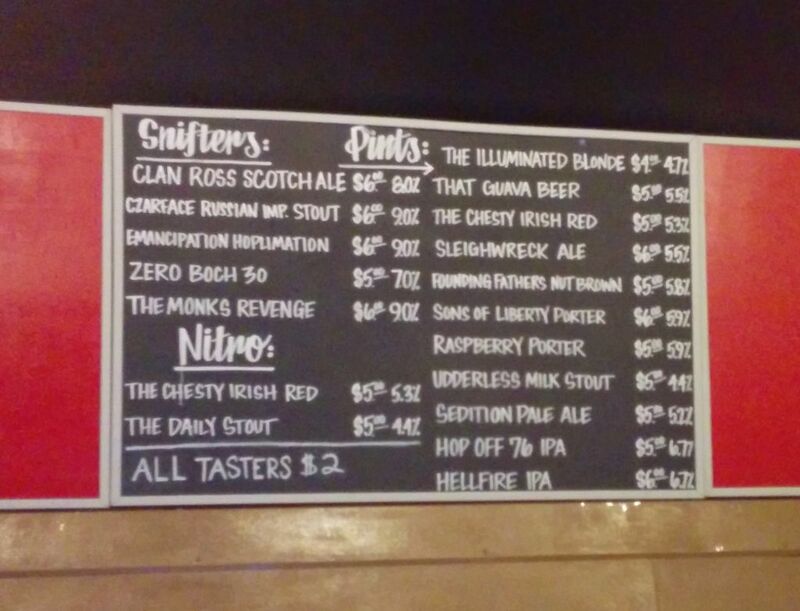 One of my favorite beers of the evening was the hellfire ipa. Though it is one of the more well balanced IPAs out of San Diego, the malts did not overpower the hops, and gave it a nice body. Having had this in the bottle before it was even more delicious on tap. This ipa is bursting with citrus and tropical fruit flavors. When compared to the hellfire the hop off ipa makes a nice contrast. It showed a very interesting flavor combination with plum flavors on the back end and almost candy sweet. Herbal hops balance it with a solid bitterness. This is the beer for those who want something different from the citrus and pine that have become so common. Then came the emancipation hoplimation double ipa. It had a very refreshing combination of flavors. Thankfully it was not as sweet as the hop off and has a nice bright orange and peach flavor going. Though it claims a high bitterness I didn’t th ink it tasted as bitter as it says. This one was also quite good. The Scotch ale delivered a flavorful set of roasted malt flavors that were balanced with a light sweetness. I really enjoyed this one. Finally the Czarface imperial stout delivered something also a bit different. The coffee flavors were mellow and the major flavor was closer to the sweet caramel and raisins. The flavors all balanced nicely giving it an overall heavy mouthfeel. Through it all I was most impressed by the hellfire IPA and the emancipation hoplimation double IPA along with the Czarface imperial stout. The lighter beers were all smooth and easy drinking and should satisfy people looking for a good brown ale. This location is fairly small and took over a sports bar that used to be in the building. It still retains the sports bar feel and shows games on the TVs regularly. It also has a decent lineup of food, though I haven’t gotten to tasting very much. The wings I had there were very tasty though the pricing seems a little high for what you get. A previous version of this post indicated that Woody’s is a better deal. However after trying some of their dinner entrees tonight I think Legacy is the better deal. The prices for all the different sandwiches includes a side of home cut fries. This is probably one of the first places I’ve been where a side of fries that comes with your sandwich is actually a good size (read small). Too many places overload you with giant portions of bland fries that need sauce to spice them up. Here, you get simply a good size portion of delicious home cut fries and delicious sandwiches. As far as my burger, I ordered the spicy burger and got a deliciously juicy medium patty, nice and salty, with fresh cut serrano chilies, guacamole, some of the best looking tomatoes I’ve ever had on a burger, and some of those fresh cut fries on the side. It might be slightly cheaper at woody’s for the same thing but their fries come in huge portions and aren’t very good. In the same group my husband got the duck confit sandwich, which he said was amazing, and my mom got the meatloaf, which was juicy and delicious. I’m also hoping that over time they will start to sell bottles of fresh beer at this location because the IPA deserves to be as fresh as possible. There is plenty of time for them to grow and for them to attract visitors from the nearby restaurants and breweries.